Last year Wisconsin Governor Scott Walker (R) signed a very public deal with Foxconnto build a Gen 10.5 TV plant in a small town near Racine. The deal, which offered almost $3b in tax credits and a number of exclusions from environmental requirements was a straw in President Trump’s job creation plan, as Foxconn agreed to create ~13,000 jobs for the complex, boosting employment and stimulating the Wisconsin economy. But Governor Walker lost the recent election and has been replaced by Tony Evers (D) who has a skeptical view of the massive project. Since there have been significant changes in the politics surrounding the Foxconn deal, it is worth examining the current status of the project. The plant was to be built in the tiny (26,000 residents) of Mount Pleasant where the village itself is buying the land from local individuals and will donate it to Foxconn, who has deposited $60m in an escrow account for the villages purchases. Thus far, the village has purchased ~85% of the land needed for the project after setting an August 2018 goal date targeting at least 2m2. According to the local press, 60 homeowners have sold land to the village for ~$30,000/acre, although some residents are concerned that if they don’t sell, the town will declare the property ‘eminent domain’ and force the sale. The first parcel of ~1,200 acres has seen construction of a warehouse/office of ~120,000 ft2which should be close to completion and ~4m yards of dirt was moved on the site to allow the construction of a 3m ft2 concrete pad that will serve as the factory’s floor. 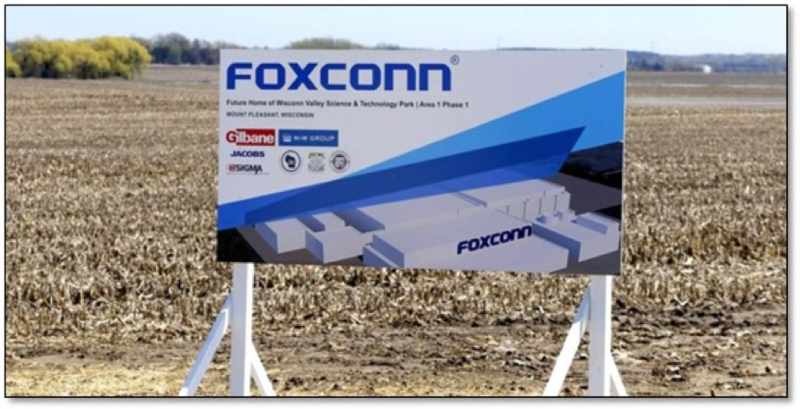 Construction of the actual plant is expected to begin in the spring of this year however statements by local Foxconn staff have indicated that the plant might be Gen 6 and not a Gen 10.5 LCD fab. While good news from a hiring perspective, as assembly workers are primarily hourly, but a bit less than the grandiose plan presented to the public last year. That’s the good news, but since the new governor was elected, he has vowed to ‘renegotiate’ the deal with Foxconn, as he fears the citizens of the state got a ‘raw deal’ as estimates that it would take 25 years for the state taxpayers to recover the pledged capital and that the deal allowed Foxconn to close the plant after 10 years, as it has done in other locations. Most recently, the Wisconsin State Audit Bureau issued a review of the deal indicating that Foxconn will still be able to receive job creation credits for home or remote workers, essentially subsidizing employees that do not live in the state and will not contribute anything to the state’s economy. At ~$200,000 per employee hire, red flags red flags were raised along with Foxconn’s recent statements that changed the hiring profile from 75% hourly workers (~$54,000/Yr.) to 80% engineers and if the company is unable to find that many qualifying engineers, it would bring them from Taiwan or other Foxconn locations. The audit also noted that Foxconn could receive all of the $1.5 in job creation incentives while hiring 20% less than the publicly stated 13,000 expected jobs by paying workers a higher salary, as the incentives are triggered by payroll, not the number of jobs created, and the maximum $1.5b credit could be met once the company reaches 10,400 jobs. More controversial was the last minute legislation that was passed in the outgoing state legislature that removed job creation oversight from public scrutiny, allowing Foxconn itself to verify the payroll numbers without confirmation. Foxconn has a long record of reneging on its promises and sometimes ignoring them entirely, and recent smartphone assembly plant closing in Brazil, another country that gave the company huge tax breaks, is another example among many. We do expect something will be built in Wisconsin, but we have our doubts as whether it will be anything close to what was originally promised, and with Wisconsin’s 3.0% unemployment rate (Racine is 3.1%), the lowest in over 10 years, the necessity for such a deal, as it was originally agreed upon, is reduced. Perhaps the new Governor will see things in a different light and changes at the EPA might cause the reinstatement of some of the local environmental laws that had to be removed to make the project viable, given that once the plant opens Foxconn will be the state’s biggest polluter. Politics creates strange bedfellows and momentum can be a serious force but we do not that the local economy has already been helped by an agreement Foxconn signed with the Ginseng Board of Wisconsin and Hsu’s Ginsengto develop Wisconsin’s ginseng industry, which already is the largest supplier of US grown ginseng to the US economy.